MARLBORO — If you look at Highland’s 1,000 point scorers, there’s a last name that jumps out at you almost immediately — Rozzi. First there was Erica, who scored 1,606. Then came Christy, who scored 1,080, and then Alison who scored 1,108. 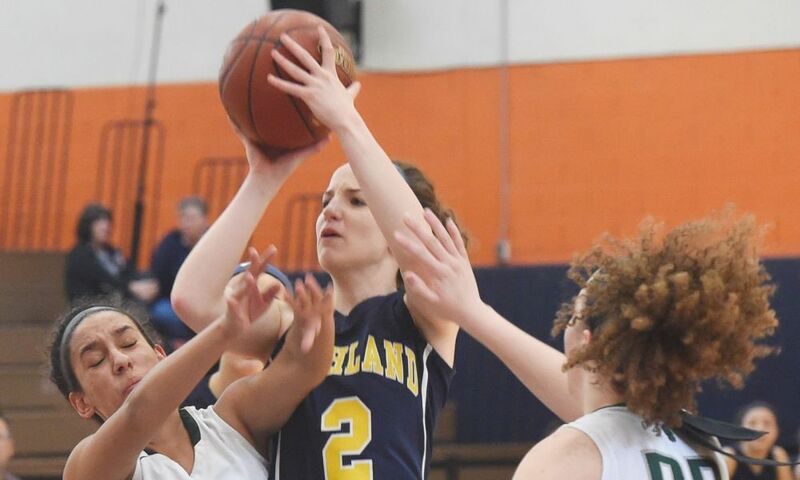 Now, Highland senior guard Bri Rozzi has more points than all of them. With a 26 point performance in a 73-55 loss against Marlboro, Rozzi became the all-time leading scorer in school history. She surpassed the previous record of 1,615 held by Lisa Pritzlaff (’01). The double teams and box-ones have been the result of what some might call a “rebuilding season” for the Huskies. Rozzi is the only returning starter from last seasons’ team that won the Section 9 Class B Championship. She’s averaging 33.8 points per game, the highest out of any girl in Section 9. After an undefeated season last year, Highland is 7-5 this season. Individually, Rozzi has done almost everything that Section 9 has to offer. She’s won a MHAL (Mid Hudson Athletic League) title. She’s won a Section 9 title. She’s made the all-state team. She’s scored 1,000 career points. “Right now, my future goals are to win a Section 9 title one last time. If we win this year it would be more special than any of my past accomplishments,” she added. Prior to the season, Rozzi committed to Loyola (Md.) University to play Division I basketball. When her Highland career is over, she wants to prepare herself for the next level. It’s already been a historic career for the youngest Rozzi. Despite what she’s done individually, she’s focused to end her high school career on a high note — with the Section 9 Class B title.